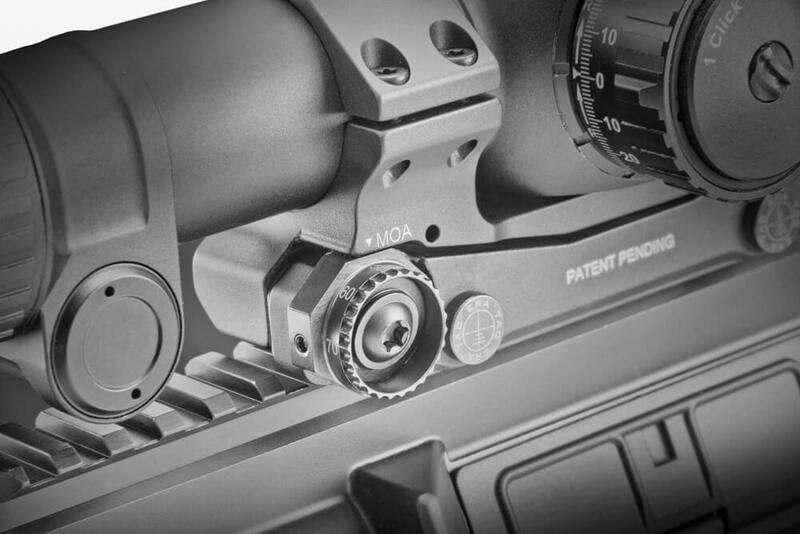 The short-version mounts are suit­able for use on all types of bolt action rifles and AR10 weapons. The 125 mm long contact surface ensures a secure and play-free fit on every Picatinny rail. Avail­able with 30, 34 and 36 mm rings in up to 6 different heights, with or without 20 MOA. Locking either with safety levers (series T1) or with hexag­onal nuts (series T2). The 2″ and 3″ exten­sions are suit­able for use on AR15 weapons. 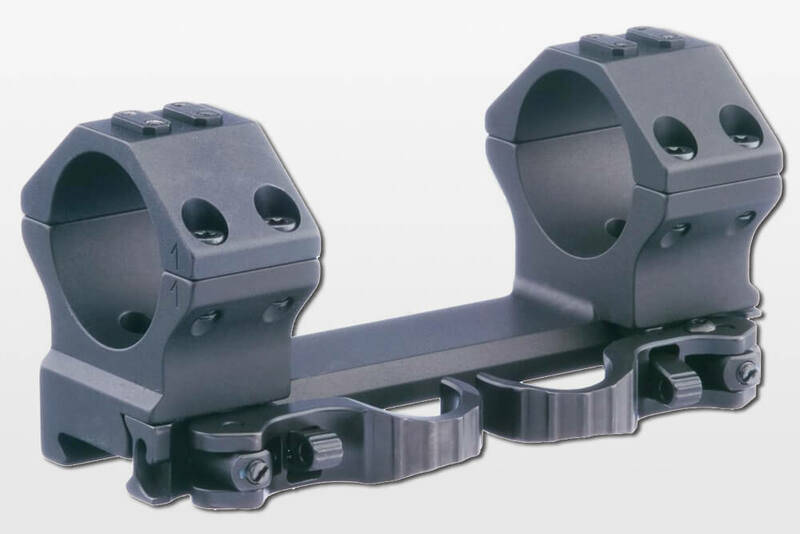 Mounts with 2″ exten­sion are also suit­able for AR10. The 95 mm long contact surface ensures a secure and play-free fit on every Picatinny rail. Due to the left-side loading lever of the weapon, the locking elements of the mount (levers or nuts) are posi­tioned on the right side. The mount has an incli­na­tion of 10 MOA. Rifle scopes of the Ultra Short series 5-20×50 have a very short middle tube. The Ultra Short without the illu­mi­na­tion unit can be mounted with any of our stan­dard one-piece mounts; however, for the illu­mi­nated version, it is neces­sary to use this special mount with reduced ring clear­ance. Ideal for long-range shooting if the reticle adjust­ment of the rifle scope is not suffi­cient to adapt the scope to various distances. Adjustable from 0 - 70 MOA with a grada­tion of 10 MOA each. It is not neces­sary to remove the scope mount as an adjust­ment on the weapon is possible. We guar­antee 100% repeat­ability and imme­diate return to zero. 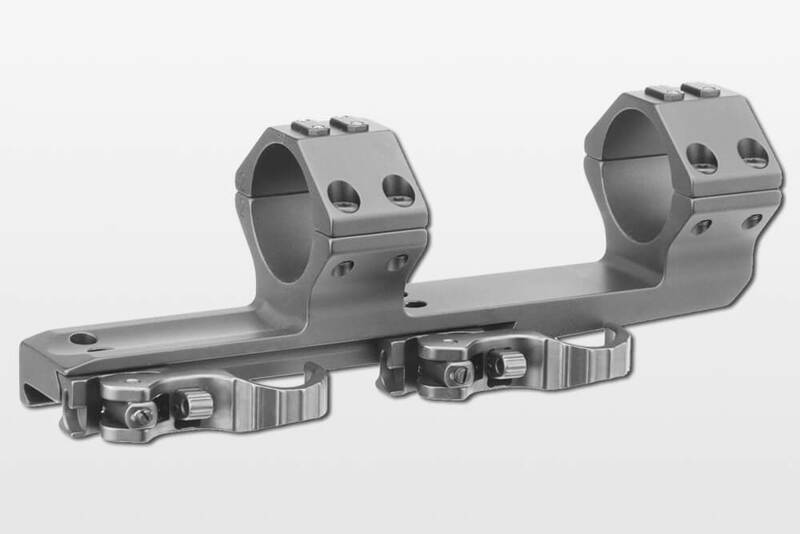 With users’ needs in mind, we devel­oped a series of scope mounts that are char­ac­ter­ized by a mini­mal­istic design and, espe­cially, their very light weight. Compared to our stan­dard one-piece mounts, the weight could be reduced by approx. 50%. The UNIVERSAL inter­face was delib­er­ately omitted. The produc­tion according to mili­tary stan­dard as well as the hard anodized surface conforming to Mil.-Spec. Type III matte black guar­antee absolutely rust-proof compo­nents. 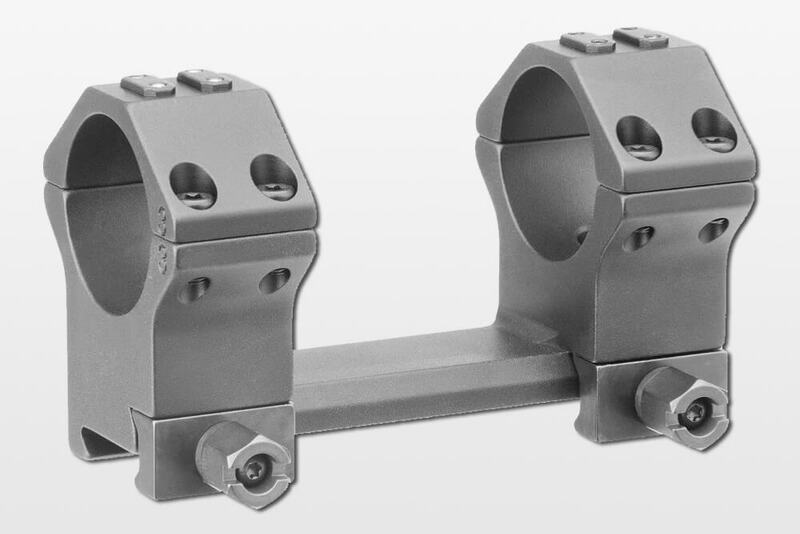 The mount is clamped onto the Picatinny rail by means of Torx screws, providing a secure connec­tion without losable parts. All ultra­light mounts ensure an absolute return to zero up to caliber .50, which has been impres­sively demon­strated by inde­pen­dent tests. On this, see also the video „Manda­tory Shock Test”. With a sensa­tion­ally low weight starting at 122 g, the ultra­light models of the short T3 series are suit­able for use on all types of repeating arms and AR10 weapons. The 120 mm long contact surface facil­i­tates a secure and play-free fit on every Picatinny rail. Avail­able with 30 and 34 mm rings in 4 different heights, with or without 20 MOA. 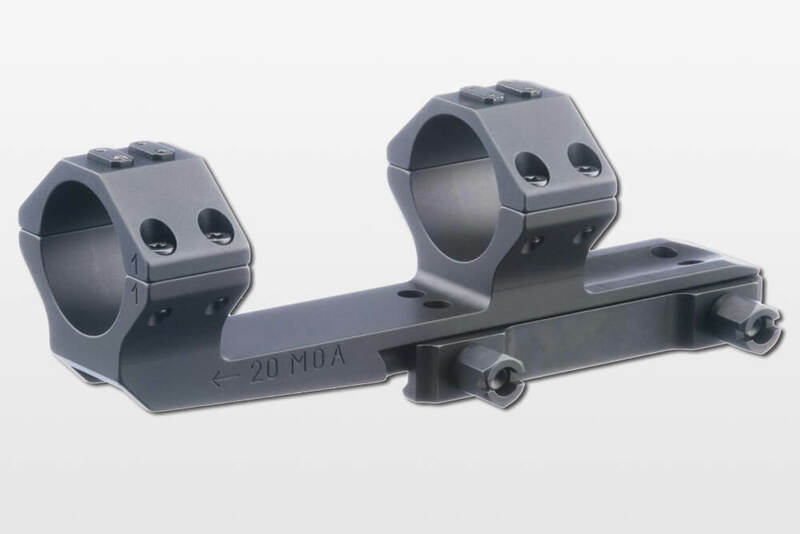 Weighing less than 150 grams, this mount was specif­i­cally designed for law enforce­ment use on AR15 assault rifles and for use in dynamic shooting disci­plines such as IPSC. The 56 mm extended version was devel­oped to provide suffi­cient eye relief for all types of use. The shorter base of the mount also makes it easier to turn the adjusting ring for magni­fi­ca­tion.